A large, upright plant from the figwort family, mullein (Verbascum Thapsus) is a biennial, meaning it grows two years in a row. The first year, the plant produces a leafy base; the second year, a single upright stalk emerges from the center of the base and produces a thick head of soft yellow blooms. Historically, the large thick leaves were valuable in treating an array of medical conditions, both internal and external. When dry, mullein leaves came in handy as kindling, used to start fires. When and how you harvest mullein depends upon how you intend to use the leaves. The second year, mullein sends up a single tall flower stalk. An herbal mullein tea consists of pouring boiling water over fresh or dried mullein leaves and letting the liquid steep for 10 minutes before straining and sipping. A decoction is simply a "boiled tea," made by simmering the mullein leaves in water for up to 20 minutes before straining. Mullein leaves should be fresh and young for use in teas and decoctions. Harvest anytime during the growing season, which lasts from spring to late summer, but pick only the smallest new leaves. Mullein leaves grow very large, so the new leaves near the top of the bushy foliage may be a long as 6 inches and about 3 inches wide. Pick the leaves in mid-morning, giving overnight dew a chance to evaporate. Rinse the fresh leaves before making a tea. Don't rinse leaves you intend to dry for later use, but select only the cleanest ones. Tea made from mullein leaves is bitter, according to the PDR for Herbal Medicines, so adding a little honey may make it more palatable. According to the "Gale Encyclopedia of Alternative Medicine," Native Americans found dried mullein leaves to be a pleasant and mild smoking ingredient for treating respiratory ailments. They also burned the dried leaves in a fire and inhaled the smoke for the same purpose. Harvest the large bottom leaves anytime during the growing season and lay them out in a single layer to dry before smoking. Alternately, pick the dried mullein leaves that remain on the plant during the winter, as needed. Gather large fresh mullein leaves anytime during the growing season to make fresh poultices to treat joint pain or gout, as the Native Americans did. You may pick a large fresh leaf, when soft and green, to wrap around your foot to relieve foot fatigue, or to wrap-up green figs to promote ripening. The leaves aren't the only valuable part of the mullein plant. According to the "Gale Encyclopedia," you may pick the small yellow flower buds and make a decoction to use as a highlighting hair rinse for blond hair. 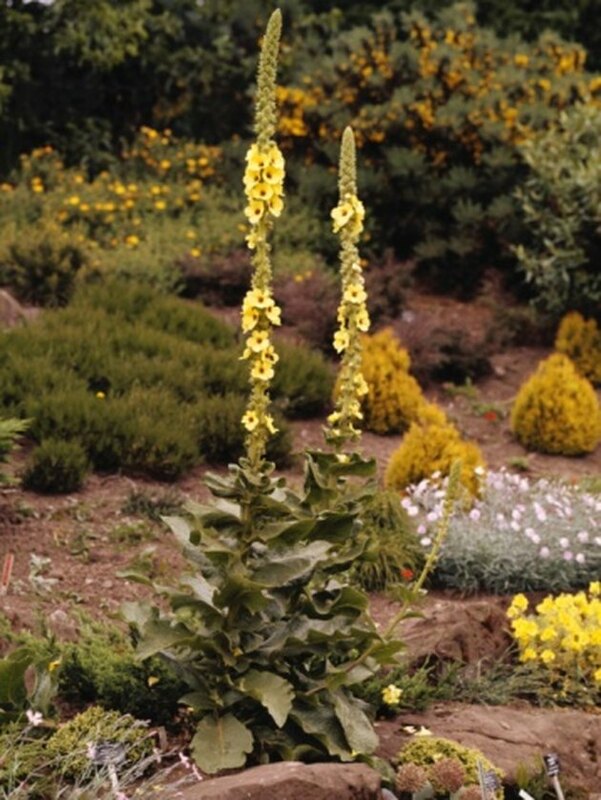 Mullein flowers bloom for up to six weeks, starting at the bottom of the stock head and gradually blooming higher. Pick newly opened blossoms or blossom buds that are ready to open. Although mullein has a long history of medicinal use, consult your physician or a certified herbalist before using the plant internally or before inhaling mullein leaf smoke.